Researchers from the University of Tokyo developed a new system to charge electronic devices such as smartphones and smartwatches wirelessly. 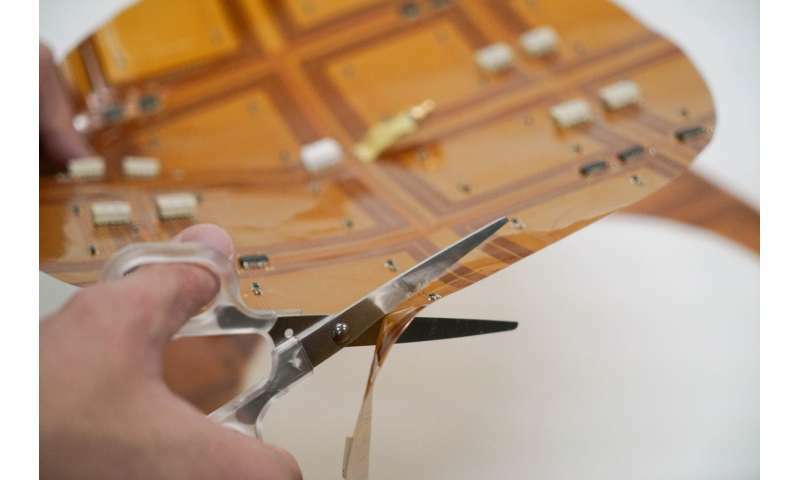 The method involves a cuttable, flexible power transfer sheet which charges devices wirelessly and can be molded or even cut with scissors to fit different-shaped surfaces and objects. "I really wish to live in a wireless world," says Ryo Takahashi of the Graduate School of Information Science and Technology. "Imagine homes and offices without tangled cables, and think how useful it could be for emerging fields like robotics." Takahashi is a master's student whose previous study of robotics inspired him to pioneer ways to power devices such as robots or smartphones simply and easily. This path led him towards the creation of the first-ever cuttable wireless power transfer sheet. It might seem strange to invent something just so it can be cut to pieces, but the idea is users can reshape the sheet to fit whatever surface upon which they wish to charge devices. "You can do more than just cut this sheet into fun or interesting shapes," continues Takahashi. "The sheet is thin and flexible so you can mold it around curved surfaces such as bags and clothes. Our idea is anyone could transform various surfaces into wireless charging areas." The clever design which allows these novel features is also what separates this idea from existing contactless power chargers. Both systems use conductive coils in the charger to induce a current in corresponding coils in the device. But the cuttable sheet is not only much thinner but has a wider usable charging area thanks to the way the coils are designed. These coils are also wired in such a way that provided enough of them remain intact after the sheet is cut to shape, they can still charge a device. "Currently a 400-millimeter (15.75-inch) square sheet provides about 2 to 5 watts of power, enough for a smartphone. But I think we could get this up to tens of watts or enough for a small computer," concludes Takahashi. "In just a few years, I would love to see this sheet embedded in furniture, toys, bags and clothes. I hope it makes technology more invisible." Imagine charging your phone, tablet, and wearable device, at the same time, in any direction from the same power source. Pi is working to make that a reality.